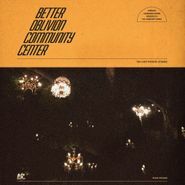 Indie/folk forces of nature Phoebe Bridgers and Conor Oberst team up for the compelling, surprisingly hard-rocking Better Oblivion Community Center. The songs often start life as gentle, introspective melodies before changing course to become fierce, gritty boot stompers. There’s anguish here, yes, with lyrics delving into themes of addiction and mental illness but the album stays buoyant thanks to the duo’s irresistible vocals and boot stomping riffs. This excellent self-titled LP will keep fans thirsting for another outing from the combined talents of Bridgers and Oberst.